Without business process improvement there is a major risk of being left behind by your competition. That’s because business success requires adopting new ways of thinking about our day to day processes. Process improvement is needed to bring all your people together in a concerted effort to improve the organization, grow the business, and enhance the customer experience. Our approach to process improvement has helped businesses in various industries to boost quality, speed cycle times and reduce costs. Our experts work collaboratively with client teams to quickly identify the excess steps, unnecessary approvals, exceptions, and workarounds that impede process efficiency. Then, working together, we quickly design a future state so that teams can do their jobs faster, smarter and easier—always working within the guidelines of doing more with less. 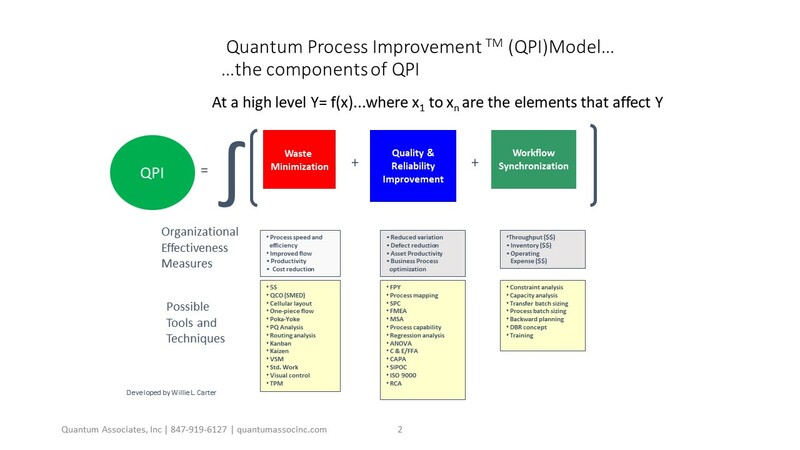 We define Quantum Process Improvement as a system that focuses on reducing process waste, variation and bottlenecks. While every business has unique processes, they all start with a common goal – to deliver high-quality, repeatable results as efficiently as possible. However, as policies change, people turn over, technology advances, and services are added, existing processes become less practical over time. Achieving and maintaining excellent performance requires an approach that supports process optimization and continuous process improvement. Quantum Associates process improvement experience can help your organization achieve the following outcomes: outdistance the competition, reduce costs, increase employee morale/retention, improve profitability and build a high-performance culture. Keep in mind the old adage “if you keep doing what you always did you get what you always got.” In other words, if your processes are not updated then your outcomes will never improve. As businesses evolve, signs of process weakness are common. Higher processing costs, more frequent quality issues, mistakes, delays, workarounds and frequent exception handling are all signs that a process is due for a make over. A careful study of your business processes will help you close the gap between what processes are currently delivering and what they must consistently deliver. “Document what you do and do what you document.” Processes are only as good as your ability to repeatedly execute them. Process Documentation – from workflows to standard operating procedures – is a key component of preparing your people to deliver consistent results repeatedly. They provide clear ways to communicate the best-known way to do a job, expectations, support training and build a foundation for continual improvement of the process. Almost all business change requires process development. New initiatives, technologies, and resources require work to be done in new ways. Our focus, as always, is on making sure the right work is being done by the right people in the most effective way possible, and that you are getting the most value from your resources. When existing processes are no longer the best approach to meeting your objectives, they must be redesigned to keep pace with change and create opportunities for improved results. Our Quantum Process Improvement approach has helped cross-functional teams redesign processes that impact organizational speed, cost and quality enabling the organization to do more with less. Our process monitoring expertise helps to prevent digression to the old ways of doing things once the process improvements are implemented. Process Sustainability establish proactive tools into processes to allow for continual checks of progress and the quality of results. We understand the need to get the most out of your processes and can help you build systematic reviews into your core business processes. Quantum Associates’ success in business process improvement has come from many years of helping organizations make their processes work for them. Now is the time to hone your staff’s skills by bringing some of our experience and expertise in-house. If you’re serious about continuous process improvement, let Quantum Associates teach your team how to distinguish between value-added and non-value-added processes and then go after improvements that enhance customer experience, reduce costs and increase efficiency. Want to learn more about our Quantum Process Improvement services? Call us 847-919-6127 or complete our contact form.